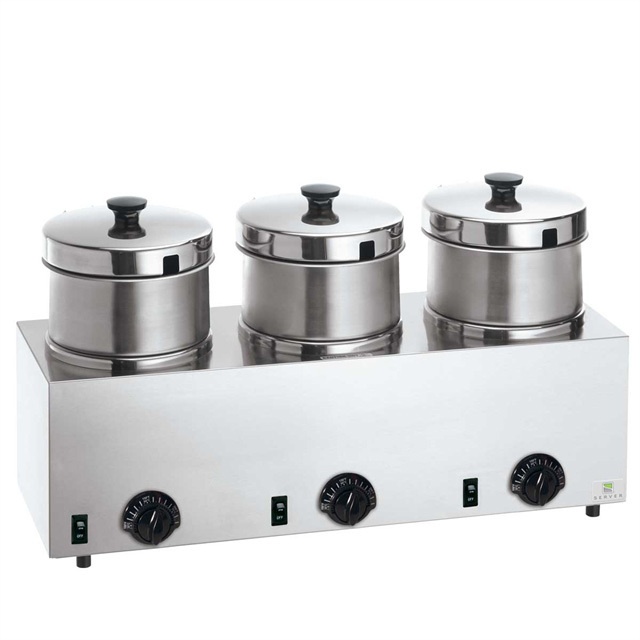 The TRIPLE FS-4 is a warmer/cooker that is constructed of stainless steel with stainless steel water vessels as well. Adjustable thermostats, with degree markings, exclusive hinged lids and water bath design keep your product at the perfect serving temperature. Server warmers feature thermostats that sense food temperature and turn the 1500-watt heating element on or off to eliminate burning or scorching. Each stainless steel inset with hinged lid has a 4-qt (3.8 L) capacity. The exclusive hinged lid catches condensation and returns it to the food to retain flavor and eliminate product loos from escaping steam.